When Suzy hears a strange rattling noise in the middle of the night, she creeps downstairs to find a train roaring through her house. But this is no ordinary train. This is the magical delivery express for The Union of Impossible Places. Whisked onboard by a troll boy called Wilmot, Suzy's world is turned upside down when she's given the job of delivering a cursed package to the fearsome sorceress, Lady Crepuscula. P.G. Bell is a native of south Wales, where he was raised on a diet of Greek mythology, ghost stories and Doctor Who. He's had all sorts of jobs over the years, from lifeguard to roller coaster operator, but all he's ever really wanted to do is write stories for a living. And now he does! He lives in Wales with his wife Anna, and their two children. Visit https://www.pgbellwriter.com/ to find out more. “I suppose we do owe you the courtesy.” The light bobbed and weaved as Stonker grappled with the lantern, then it flickered out entirely. It took Suzy a few seconds to blink away the red and green smudge it left on her vision, and then she saw him. He was the same sort of creature as Fletch, though his skin was a flinty grey and less warty and wrinkled. He wore a smart blue uniform, with a coat that reached his ankles and a peaked cap with silver piping. He looked down at her past both his enormous nose and an equally impressive salt-and-pepper moustache, as thick and lustrous as a badger, which hung down almost to his knees before the tips curled back up into rigid little spirals. His blue eyes twinkled as he spoke. “J.F. Stonker,” he said. “Driver of the Impossible Postal Express. The finest troll train on the rails.” He reached up and gave the locomotive’s boiler an affectionate pat. “But that wasn’t my fault,” said Suzy, feeling the temperature rise in her cheeks. “The tracks aren’t supposed to be here. None of this is supposed to be here. Including you!” This was all starting to feel terribly unfair. “Normal proportions?” For the first time, Suzy realized there was a question she hadn’t asked herself: how could such an enormous steam engine possibly fit inside her house? She looked up past the locomotive, and saw the hall ceiling, impossibly high above her head, the purple light shade like a distant hot-air balloon. The hall had grown to the size of a cathedral without her even noticing. “Wait a minute.” Suzy fought to digest this new information. “Is it?” said Fletch, feigning surprise. Inventive and imaginative this is one adventure where you won't want to get off. A fantasy adventure crammed with quirky action. All aboard for an unforgettable journey. 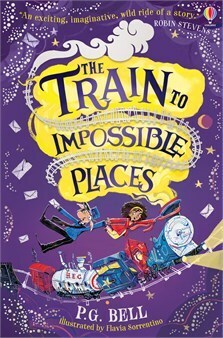 This wickedly amusing tale of trolls and trains and physics waylaid by fuzzics, reaches out to children with its quality writing and suspenseful rip-roaring inventive adventure, but definitely speaks to adults with nods to disgruntled postal workers and train engineers. This is a highly enjoyable read with a smart, determined heroine. The world-building is superb, vivid and well realised, filled with fascinating delivery stops: magic towers, a watery grave, a troll town under a bridge, all packed with characters you would love to meet. Bursting with influences, particularly Douglas Adams and Terry Pratchett, but has a crazy, pacy charm all its own. With clearly defined characters all with motives for their actions, an understanding of the rhythm and flow of a good book, comic flair, and above all a top-notch fast-paced adventure plot, this is a phenomenal new novel. The character building in this story is wonderful, with lovely dynamics created between the most unlikely of individuals. A tale destined to become a classic; a rip-roaring adventure full of mystery, magic, goodies, baddies, laughs, thrills, spills… oh, and a science called fuzzics (that’s physics, only fuzzier). This roller-coaster of a book is pacey, fun, and full of lots of fantastical new ideas. A harum-scarum fantasy adventure crammed with quirky action. Full of unexpected twists and turns, this is an ingenious and unusual story. An incredibly confident debut which is endlessly imaginative, highly inventive worldbuilding and a plot every bit as unpredictable as the train itself. There are short, sharp chapters with cliffhangers which make it a great choice for bedtime reading with an adult or an independent middle grade / teenage reader more used to shorter books. Punchy opening. The description was amazing and it really helped me to create a picture in my head of what it would look like in real life. I would definitely recommend it to anyone who likes a lot of action. I really liked this book because it was very adventurous and exciting. I give this book 10/10 because it is so amazing. This book is amazing because it really uses your imagination. It has great language and it is sometimes amusing and intriguing. We shared the reading of this one. My eight year old liked it as much as I did. It has an almost Enid Blyton feel about it with a bit of Pratchett and something else, not quite Harry Potter, even though there is magic, heroes and villains in it. It has a certain charm about it. Imaginative, exciting, it keeps the reader wanting more and on his/her toes with the numerous twists in the plot. There are a strange range of characters and incidents in it. My son like the idea of a train fuelled on bananas, Trollville and Wilmot, the Postmaster. Overall, quirky, entertaining read. A truly marvellous adventure story. Suzy is a totally refreshing heroine, she really likes physics and she is in her pyjamas! A sound wakes Suzy, when she goes to investigate, she finds a troll laying tracks for a train in her home. The train is a postal delivery train, delivering mail across the Union of Impossible places. Rather rashly, she decides to hop on board. She is given her first parcel to deliver and soon she is intertwined with the fate of the impossible places. We really enjoyed this book, we loved the idea of imagining places we might go to too that defy the laws of physics. A really great read! This is a fast-paced, well written, magical adventure, and is full of clever puns and jokes. As a 10 year old, it’s hard to imagine what living upside down or in the Moon would be like, but this book really gives you an insight into a brilliant, mythical world. When Suzy Smith discovers a train roaring through her house she’s quickly whisked aboard and tasked with delivering a cursed package, but she soon discovers that the fate of the Impossible Places might be at risk. I really enjoyed the chapter where the World is frozen in time, because Suzy wasn’t stuck and everybody else was frozen mid-action. There are a lot of twists and turns spread throughout the book. I would 100% recommend this book for anyone age 9 to 11, especially fans of Cressida Cowell. All in all a great read! Troll-boy Wilmot gives his top tips on how to write a letter. World Book Day talk to the author about his inspiration for the magical tale, his research process, and much more! Write down which weird and magical place the Impossible Postal Express will travel to next and complete the impossible maze.